Martin Luther’s Ninety-Five Theses are far more known than read, and probably far less understood. It is worth our time to actually read and attempt to understand the Theses themselves, especially from within their context. Popular treatment of the document has ignored both context and structure and the church is, therefore, unfamiliar with what the document is actually doing and saying. Understanding its literary structure, however, will help us to read the Ninety-Five Theses rightly. The Theses are clearly written for debate. The intent, on Luther’s part, was to provoke an important conversation on the issue of indulgences. He not only invites feedback, but he expressly asks that those who cannot be present for debate send their responses via letters. He wanted to wrestle with his assumptions and assertions about penance and satisfaction, and about the indulgences themselves, and he wanted his colleagues to assist him in this wrestling. There never was a debate, but it was his intent to discuss the matter. Still, the document contains some unique features that are not normative to this type of document. There is a great deal of rhetorical flair, impassioned wording, and bold denunciation. He appeals both to the academic reader, the intellect, and to the heart. He writes as both a theologian and a pastor. These additional features, Luther’s wording, and his passion is part of the reason that this document received such attention from Rome. Luther, of course, didn’t help himself when he sent the document, with a letter, directly to the highest papal representative in Germany, Albrecht of Mainz. Albrecht’s concerns led him to promptly send it on to Rome. This unlikely document, because of its unique features and precise wording, was indeed a spark that set off a blaze. The structure of the document largely followed expected form. The rhetorical rules of the day required that documents start with an exordium, which was the formal introduction and was designed to garner the reader’s attention. Next would be the narration of accepted facts, followed by a succinct description of the subject to be debated. The most lengthy part of the document would be the confirmation. Here the author was defending their premise, attempting to prove the argument. The confutation followed, and here the author would anticipate objections and offer responses. Finally the peroration summarized the points, applied tot he reader’s good will, and ultimately concluded the document. Luther’s work generally follows this same pattern. The introduction appeals to the reader and attempts to draw them in by stating that this debate should take place “out of love and zeal for bringing the truth to light.” Here is the exordium to the document. Theses 1-4 serve as the narration, the generally accepted facts that were not up for debate. Theses 5 is the heart of Luther’s document, the major premise of the document to be defended. Theses 6-80 are the confirmation. 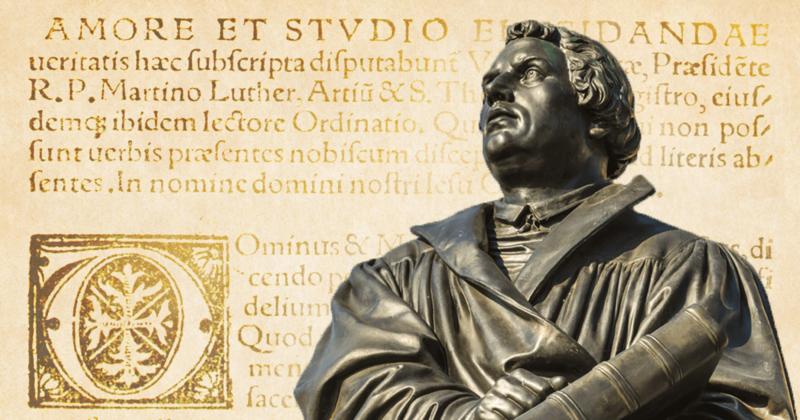 Throughout these theses Luther defends his argument and offers the standard proofs required to uphold his premise. Theses 81-91 are the confutation. Luther makes a unique rhetorical turn in this part of the work, but overall it is intended to serve the same function of anticipating objections and offering rebuttals. Theses 92-95 are the most rhetorically rich sections of the work. Luther’s opponents almost entirely ignore these final theses because of how impassioned they are, but they serve to conclude the document as a whole by making appeals to the reader. In future posts I will explore each of these divisions more carefully to articulate Luther’s overall point. It is helpful at this moment, however, to note that exploring the structure helps us to read the Theses correctly. It is tempting for the inexperienced to read the Theses as a list of debated topics. Each theses is another point of contention between Luther and the papists. In reality the document is a progressively building argument for understanding indulgences as relating to ecclesiastical penalties not divine penalties. In fact, some theses are two parts of a single sentence, so treating them as separate arguments won’t do. Understanding the structure of the document, however, helps us to see how each theses is functioning in the flow of Luther’s thought. Is this part of proof, refutation, or summation? Understanding the overall arrangement of the document can better clarify the individual pieces. We can read it rightly, then, when we understand it structure.